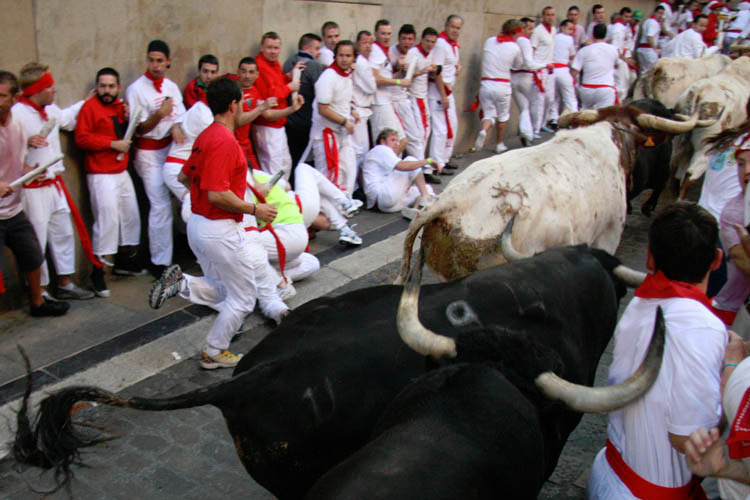 The first running of the bulls of the 2008 Sanfermin fiestas, with bulls from the Conde de la Corte bull ranch, has been a dangerous run which lasted 4 min. 20 sec. Thirteen runners are reported to have been taken off to hospital, none of them suffering from a goring. The rear bull, which had become separated and left behind by the others, caused some moments of tension and drama at the Telefonica stretch, where it turned back continuously and threatened to charge at the runners. At Santo Domingo the runners paid homage to the mountaineer, Iñaki Ochoa de Olza, who died recently in The Himalayas, as they waited for the first rocket to go off to start the running of the bulls. The pack of bulls were slow to leave the pens in Santo Domingo but then they began to run at a very fast pace up the first stretch. This stretch was packed with runners who tried to find some space in front of the horns to make their run. As is usual on this stretch, there were many trip-ups and falls on both sides of this stretch and almost at the entrance to City Hall square, a runner was violently charged by one of the bulls. The bulls crossed the City Hall square at a fast pace and on entering Mercaderes the three rear bulls slipped up and two of them crashed into a bunch of runners who were standing at the corner on the right side of the street. This caused some moments of general panic as the two bulls threatened to gore several of the runners who had gathered on this side of the street to watch the bulls go by. The pack was now broken up and four bulls lead the charge into Estafeta Street, while the other two bulls were left behind at Mercaderes. There was some spectacular running to be seen in Estafeta Street, as the pack of bulls began to stretch out and this allowed some runners to get in close in front of the horns of the separated bulls. The two bulls bringing up the rear caused moments of great danger, especially the rear one which found itself totally alone and it began to turn back several times on the Telefonica stretch. Thanks to the good work of the herdsmen, the runners were able to lead the bull little by little towards the entrance to the bullring. The bull finally entered the arena without any further ado. Once inside the bullring arena, the first four bulls which had been leading the pack were quickly led to the pens. But the two rear bulls got distracted once inside the bullring and they raced around the arena in different directions. One of them knocked down and almost gored a runner on two occasions. It took a while to get the two bulls to head in the direction of the pens and by the time they did so more than four minutes had passed since the start of the run. 11 running bulls. 4 goring. 49 traumatisms.